You are here: Home / MCAT Resources / Step 3: MCAT Resources: How Many, Which Ones, and When? Step 3: MCAT Resources: How Many, Which Ones, and When? In Step 1 you learned all about the MCAT, in Step 2 you created a timeline and set your targets. Stumbled onto the Ultimate MCAT Prep Guide? Click to Start at the Beginning. Let’s quickly discuss resources so that you are ready to move on to Step 4 and plan your daily/weekly study schedule! Chances are, you’re on a strict budget and can’t afford to spend much on study resources. As a college student, I was living on my own and working multiple part-time jobs to cover rent, tuition, and general living expenses. There are many free resources available to help you prepare for the exam, such as this very guide, my website’s tutorials, cheat sheets, quizzes, and YouTube channels. The AAMC, the author of the official MCAT, understands that not everyone can afford to pay for extra help. To help, they have established a Fee Assistance Program that has some resources included. Click here to learn more about how to qualify for this aid. See my MCAT Resources page for the most up to date list of student-recommended MCAT prep books, exams, and more. such as AAMC materials. Additional practice material and full length practice exams are not free but they are crucial for your preparation. These start at $25 (AAMC sample) to $249 (entire Next Step full length set –10% off code available on my resources page). Additionally, the MCAT exam itself will cost you: $310 in 2017. Here’s what it boils down to: the entire process will NOT be cheap. You can’t approach this from the “I must find only free resources” perspective. Think of this: a small investment (in comparison to the big picture!) into your MCAT resources, as needed, give you a stronger chance at arriving at your MCAT goals, and ultimately realizing your dream to become a physician. Content foundation is the start to a solid MCAT strategy. While the MCAT is more focused on strategy and less on content, you still need a solid content foundation. I recommend building that foundation through preparing with a combination of video and books. Do not assume you know or remember the information from class. Regardless of whether you just finished a class this semester or took it five years ago, you STILL have to review. This can be as easy as skimming the content to ensure you still know it. Or as difficult as learning/relearning it completely from scratch. This of course depends on your level of exposure and comprehension in each MCAT science subject. If I’m reading something that holds my attention, I can stick with it for hours. When the seventh Harry Potter book came out, I started reading at night and only put it down at 5AM when the chapter was a bit slow and my tired eyes won the battle. But when I woke up a few hours later, I kept reading till I finished the book! When taking physics in undergrad, I frequently woke up with my face planted in the book. I discovered YouTube during Calculus 2 and frequently watched Patrickjmt tutorials into the night! Material that I found boring often left me frustrated. Especially when it was confusing or unclear. If you’re the same way, wouldn’t you rather have someone TEACHING you the information? This is where video resources come in. As already mentioned, these can range from Khan Academy MCAT videos, to Chad’s Videos, to Crash Course, my MCAT Youtube videos, to paid video programs such as the big name online MCAT courses and my MCAT Study Hall. I see videos as the best starting resource. Forget torturing yourself by trying to understand complex information on your own! Let the instructor teach you the information while you listen and take notes as you begin understanding. Videos are not about passively watching the screen and letting the information sink in. You still have to participate! Watch and try to understand, take notes, pause and rewind when you get stuck. Learning from videos should be an ‘active’ learning process! That’s why I find them more effective. As opposed to just books, videos are usually not cold, black text on a white page! Instead, it’s a human expressing concepts in a dynamic and hopefully easy to follow method! We will discuss how to effectively learn from videos in Step 4. Assembling: Take some time during this Step and browse through different video resources. As a warm up, I recommend finding one go-to video learning that you know is a good match for you! Make note of your choices in your Companion Workbook so you won’t forget. I love video, but you can’t discount the books. What if you haven’t covered everything? How do you know you didn’t miss something? You need books to verify that you are getting all the material you need. I don’t mean breaking out your old, ten pound college physics textbook! I’m referring to books written specifically FOR the MCAT. Books that teach concepts following the AAMC topic outline with an MCAT focus. 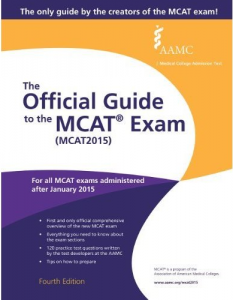 Before you purchase content books, pick up your copy of The Official Guide to the MCAT Exam. This is the guide published directly by the AAMC. It contains everything you need to know about the MCAT in excruciating detail. The book even includes 120 practice questions 30 per exam section, tips for the exam, scores, and so much more. As of the time of writing this guide, Kaplan and Examkracker books are most recommended by my students. Kaplan is great for content but their questions are… a bit on the confusing side. Examkrackers (EK) content is NEARLY as good though a bit TOO concise. But EK includes great practice questions and practice passages at the end. Many students also like their (old exam) 1001 book series for additional practice — though I fear they are overkill and will slow down your progress. Caution! With books constantly changing, it is difficult to stay on top of the most current information available. Concerned about changes? See my MCAT Resources page for the most up to date list of student-recommended MCAT prep books, exams, and more. The edition of the books really does not matter! — Even the book company DOES NOT ultimately matter either. If you’re in a position to purchase new books, get the best books! But if you have other books, use them anyway. Why spent $200 if your friend just finished with a perfectly usable set of ‘okay’ books from another company? Even MCAT books written for the old exam (prior to 2015) are okay. IF you are using an older MCAT prep book, simply add Biochemistry, CARS, and Psych/Soc books to your collection. Remember, science is science, and content is just the foundation! You need a set of books to learn. Once you’re done with the foundation, you’ll be learning EVEN more from your practice exams and subsequent review. Just ensure that you put the right efforts into practice Phases 2 and 3 to be certain any missing content doesn’t haunt you in the long run. Assembling: Choose just one or two sets of content books — when one company doesn’t quite cover all the information, the other company may supplement. Record your choices in your Companion Workbook so your list is all together in one place. As we’ll discuss in Step 5, the more you practice, the more you’ll realize that content alone is NOT enough. The MCAT does not test your ability to regurgitate knowledge on physics, biochemistry, sociology, etc. Instead, it tests your ability to reason through passages while expecting you to already have a FOUNDATION in the sciences you’ve studied. Think of an IQ exam. An IQ test is not testing your math skills, but some use it to to find your IQ, or to find your ability to use and manipulate information that you already know. It tests how you think. The MCAT does the same thing and simply uses your thorough knowledge of sciences, reasoning, and humanities. You need to PRACTICE what you’ve studied. Practice questions and practice exams build your critical thinking skills that are pivotal for the real test. They also shed a light on your weaknesses in content, comprehension, testing approach, and more. This is reassuring. If your book missed a few crucial points, you’re still okay. How? You will learn from your mistakes! And with enough practice passages and exams, your content holes WILL reveal themselves one at a time in the long run. Let’s take a quick look below to give you an idea what practice will look like, but we’ll focus on practice/review in more detail in Step 8 (coming soon). For science practice, I recommend starting with simple practice resources. When just learning the foundations you shouldn’t be attempting difficult passages. Basic discrete (non passage based) questions will quickly let you know if you’ve mastered a topic or not. Then you know if you need to spend more time on this topic or if you’re ready to move on. As you see yourself getting really good at these straightforward questions, go to increasingly difficult passage-based questions. These questions get you closer and closer to MCAT-style testing. These questions can be found within and at the end of each chapter in most MCAT content books. These should be enough for Phase 1. You can use additional books for extra practice in your weaker topics. Specific science resources can be found on my MCAT resources page. Unlike the sciences, with CARS, you need to practice your ‘strategy’ more than study content. You develop reasoning skills through exercises like the Newspaper Strategy and sharpen them with continuous practice. The purpose of reading practice isn’t to build your vocabulary or learn about the author’s subject matter. Instead, it is to improve your endurance and concentration. Furthermore, it is to improve your comprehension of difficult and boring passages. You develop analysis skills through CARS passages, and a lot of them! The best CARS resources, to date, are also ranked/listed on my MCAT Resources page. If you’re just starting out, research the different techniques out there. See which one appeals to your learning and thinking style. Then try it out. I’ve been hearing great feedback regarding Testing Solutions for CARS including the 30-day guide (which is free with a Kindle Unlimited trial). Assembling: For CARS you’ll want to start with multiple resources. Start with one source of practice passages for sciences –such as Khan Academy (free online). And a few more for CARS. Record your chosen resources in your Companion Workbook. And finally, what better way is there to prepare for your official MCAT than by taking full-length practice exams? Under real MCAT conditions of course, as closely as possible. Ideally, the full-length practice exams are identical to the real exam and created by the very same test writers. Unfortunately, as of the creation of this guide, the AAMC has only released two scored full-length exams and one ‘sample’ unscored exam. These are decent at best. Student feedback ranks them somewhat close to the real thing, thankfully. But three practice exams are not nearly enough. You’ll need regularly scheduled practice full-lengths to solidify your testing abilities. This means you’ll have to purchase additional full-length exams from other MCAT prep companies. My students currently rank Next Step as the best practice resource due to volume (ten exams), similar interface, and overall similar style as the real MCAT exam. But they are constantly improving and updating, so once again, I must refer you to the MCAT Resources page. Assembling: At two to three months before your exam you’ll want to acquire EVERY SINGLE AAMC RESOURCE available. After all, they do write the exam. So you don’t want to miss out by not reviewing their published practice materials. The official MCAT authors are the best source for full-lengths! More on full-length practice exams when we discuss MCAT Prep Phase 2 in Step 5 of this guide. Some of my students have signed up to work with me after they had taken courses with Kaplan, Princeton, Examkrackers, Next Step, Altius… the list goes on. Some students sign up for multiple prep courses AT THE SAME TIME! Some students own nearly EVERY current MCAT prep book and have access to every online resource! These students have so many resources they are overwhelmed. Do you review the first chapter in every book before moving on to the second? How many practice questions are enough? Are you considered a failure if you only review the questions in one or two of the FIFTY books? Don’t fall into the trap of getting too many resources. Get enough, and no more! At the end of the day, it’s not about how many resources you have or use. The ‘real’ MCAT prep comes from practice: doing passages, reviewing, identifying your weak areas and strengthening them. It comes from hard work and utilizing whatever resources will help you do that best and reach your goal. You could have a hundred books but if your scores plateau, then they are, sadly, useless paperweights. So invest wisely on quality and helpfulness, not quantity! Assembling: See what you wrote in your Companion Workbook. Do you have too many resources listed for content and practice? If yes, cross them out. They provide one simple, yet generic plan to follow with multiple resources. This works really well for many students. The course provides a structure or framework of learning and a teacher to set the pace for your studying. For some students, this is critical — they need a schedule to follow and check off. Some courses focus on strategy, and of course expose the students to testing material from books and company exams. As you work through practice questions and full lengths, you’ll come across concepts and terminology you’ve never seen before. Some of which are not even covered in your resources. This will happen quite frequently. But you can’t afford to just blame your book! “My book didn’t teach this,” will not fly on the MCAT. You must do all you can to be as prepared as possible. Take note of the concepts and FIND A WAY TO LEARN THEM. Consult with Youtube, Google, or ask a friend, and get these covered however you can. Sometimes studying on your own is just not enough. You can watch all the videos and read all the books. you might need an experienced outsider to help you recognize where and why you’re not understanding material and/or losing points. At this point, you may need to enlist the help of a tutor. They provide more hands-on approach with personal tailoring. The assigned tutor takes you through all of the material from start to finish. The benefit is that the tutor works with you on your individual requirements and weaknesses. This ensures that whatever is holding you back doesn’t hold you back for too long. Also, this can range from a big name company private tutoring options, to MCAT experienced private tutors from school, friend referrals to ones you find online. And then there are hybrid programs such as my MCAT Study Hall, which provides both learning with one-on-one guidance, AND structure and accountability. Books/videos, practice material, full lengths, and one-on-one help are the bare minimum tools (resources) to add to your arsenal. There are a number of additional recommended resources and study aids to help you make the best of your prep time. Without overdoing it, make your choices according to your preferred learning method. Let’s face it, you’re a premed student. You’re busy and always on the go. Why not make it easy to study on the go? You can create your own flashcards by cutting up bits of paper or purchasing a set of blank index cards. Learn how to utilize them here. Another option is digital flashcards such as Anki or Brainscape. You can explain something to me a hundred times, but if you SHOW it to me, preferably in color, not only will I remember faster, I’ll also retain it longer. Do you learn the same way? These are great for your daily/weekly Active Writing. You’re pretty busy, but when your brain isn’t, get an armband for your cell phone to listen to videos when utilizing the Audio Summary Strategy. We discussed many resources above. The most important thing is to choose and move on. Don’t spend months researching which books or exams are better. Get something and get started. 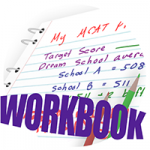 Refer back to your Companion Workbook for your target score and test dates. Create a study schedule that will utilize the resources you have (or are about to acquire). Be sure to download the Companion Workbook to help you keep track of what you learned in this chapter. Focus on the specific resources, and of course your biggest takeaway from this chapter.